Panch Phoran is a spice mix of 5 different spices . It is made up of a blend of whole seeds containing cumin, fenugreek, fennel, mustard and black onion seeds (kalonji). This seasoning mix is excellent for flavouring when used in vegetable dishes, chutneys or dal (lentil) or fish recipes. In the tradition cuisine of Orissa and Bengal, one usually first fries the panch phoron in cooking oil or ghee, which causes them to start popping immediately. Vegetables (especially potatoes), lentils, or fish are then added to the oil-and-spice mix sputtering in the cooking vessel so as to coat them with the spice mix. 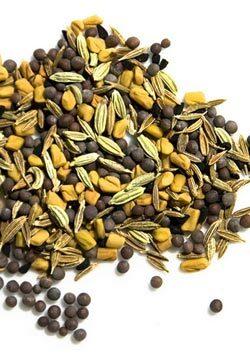 2 tsp each of Cumin seeds, Fennel, Onion seeds, Black mustard seeds and 1 tsp of Fenugreek seeds in proportion. Grind them together and store in air tight container. Do not make this in a large quantity, else it will loose out in aroma. Acts as a digestive, anti inflammatory, anti bacterial laxative. Treats Diabetes, heart burn and Skin diseases. Good source of Omega-3 fatty acids, Dietary Fiber and Minerals. Very useful and detailed post. Useful info .. I have heard of this spice mix, but never used it. Hey just stumbled upon your blog. I knew this lovely Bengali lady who lived next door who used this spice mix sometimes but I always wondered what it was made up of. Now I do. Thanks.